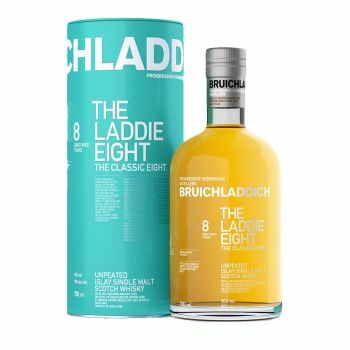 The unpeated ‘Laddie Eight’, is the latest exclusive for GTR released by head distiller Adam Hannett. His aim with this vatting is to preserve the elegant, floral notes of the vibrant young spirit while building up the signature salty, citrus tang so characteristic of Bruichladdich. He understands that eight years maturation in a warehouse that hugs the shores of Loch Indaal will impart complex notes of apple, pear and subtle layers of oak. His reward is this graceful single malt that relates to a very modern craftsmanship. Bottled in-house by their talented young workforce of 85 Islay men and women, at the unusually high strength of 50%. It speaks clearly of the quality of ingredients, and the importance of the remote Hebridean environment in which it evolved.